All is well inside the Columbia Basin's salmon recovery bubble. Most fish runs are above average, hatchery runs aren't hurting wild stocks, smolts are barely stopped by the dams in their way, and thousands of acres have been rehabbed for future finny inhabitants. That was just part of the happy message from Action Agency folks who were reporting at the halfway point in the contentious 10-year BiOp governing hydro operations, where hydro operations seem to be one of the minor factors in the whole darn thing. Unlike the housing and tech bubbles, this one has real staying power. It won't deflate unless people stop paying their electric bills. Goals are being met, including the number of PowerPoints required to explain the message to members of the Northwest Power and Conservation Council at their July meeting in Seattle-most of whom weren't even here when the 2008 BiOp hit the streets. The enthusiasm was infectious, as member after member expressed appreciation for the progress. It didn't even matter that the Council chair represented a state that has fought the BiOp tooth and nail in federal court for years. I was getting stoked myself until I realized these folks were grading their own performance. By the sound of things, it was likely in the B+ range. There could be some bias there. I was familiar with the topic, since I once had the chance to do the same thing, in grad school. It was the only time I'd gotten straight A's since 8th grade (It was San Francisco in the late '60s, and the place was on strike, after all). As I recollect, the BiOp implementation review included the old saw that this is pretty much the most expensive species recovery effort on the planet, affecting a region the size of France. Sacre bleu! Where else could this have been pulled off? No place but the richest country on the planet, with the best dams and cheapest electricity. And we got to create the world's largest bird feeder in the process! Then a cold rush of air bathed my row of seats up in the top of the old Sheraton in Seattle and a whiff of a potential column came wafting in ... Never has so much, been spent on so few, for so little benefit. Something pricked that salmon recovery bubble and the reality of life outside intruded. What's really behind all those increasing salmon runs? Mostly the ocean, of course. Luckily, for us, the North Pacific shifted into a regime of increasing productivity about the time the 21st century rolled in, along with the 2000 BiOp and a whopping spring jack count that presaged some of the largest Chinook runs in decades. So how much credit can a BiOp claim that's run for only five years--barely one generation of salmon? Not much, as far as fish numbers go, except for supporting special success stories like Snake fall Chinook and sockeye that began long before this BiOp was in place, or those fancy water slides at the dams. Maybe we're not setting records for most fish runs, but we are setting records as far as spending goes. With a direct program budget that tops $250 million a year, nobody remembers (except for old readers of NW Fishletter) that less than 10 years ago, such expenditures were unthinkable to anyone but a few tribal stakeholders pushing to double BPA's then $140-million fish budget. The dream is now nearly a reality, and ratepayers are firmly on the hook for supporting a jobs program created under the guise of garnering support for rebuilding stocks in the Columbia Basin. Does anyone seriously think stakeholders who benefit from it will allow that to end when the next BiOp comes round? The Yakamas have a plan in the works to rebuild a few fall Chinook and coho runs in their namesake river that would rely on a new water management plan estimated to cost $4 billion over the next 30 years, if implemented. Local, state, federal entities and water users are expected to foot the bill. Backers say "an initial investment of $45 million by the state for 15 early-action projects would yield nearly $90.7 million in economic benefit and create over 680 jobs." Legal obligations to tribes and from dam building require some of these actions, but nobody really knows whether they are the correct ones. The region's elite science panel recently admitted they can't figure out whether all those BPA-funded hatchery programs in the basin's F&W program are helping or hindering the recovery of wild stocks. The tribes and the sporties want fish, and hatcheries are where most of them come from, so we keep on building them, based on the best available political science. Just about the only programs BPA seems inclined to cut are ocean data-gathering projects that are starting to show that fresh water conditions, including spill, don't really have much of anything to do with adult returns. BPA says information from these projects should be used by freshwater fish managers before it feels comfortable funding them. That's not likely to ever happen. How many hatchery managers will voluntarily cut back production releases when some pointy-headed oceanographer tells them that the water is warming up and millions of hake are waiting offshore, just outside the salmon recovery bubble, to gobble up the smolts that get past the birds? But reality always intrudes at some point, and the ocean will warm up again some years out, as it did in the 1980s and 1990s. Fish runs will likely decline once more, big-time, no matter how the hydro system is run, treaty with Canada or not. Witness the reduced return of this year's spring Chinook run, much below NOAA's predictions, which were based on its ongoing monitoring of biological and oceanographic conditions. All signs pointed to problems outside the region, far from the bubble, in the Gulf of Alaska, where warming waters are generally getting the blame for declining Alaska Chinook runs. NOAA Fisheries researchers have seen the declines right under their own noses, by counting fish returning to a hatchery associated with their Auke Bay lab near Juneau. Smolt-to-adult Chinook returns have dwindled below 0.5 percent for these fish that have no freshwater migration at all or any dams to decimate their numbers They hit the salt water directly from the hatchery. When times were better some years before, the returns had been three to six times higher. It's funny. Spring Chinook returns to Bonneville Dam were about four times lower in 1999 than they were last year. We're in the middle of the best cycle for Columbia River fish in years, thanks to the Pacific Decadal Oscillation, which will hopefully stick around for another decade or so. Just don't expect miracles from the hundreds of millions of dollars that BPA is plowing into habitat restoration. When the Fish Accords were signed in 2008, tribal fish managers estimated mostly modest improvements over decades. For Yakima River steelhead, they pegged an improvement (in 25 years) in egg-to-smolt productivity of 17 percent from all the habitat actions in the accords. 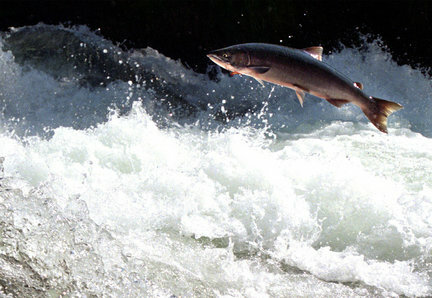 For Tucannon River Chinook, the increase in productivity was estimated at 5 percent. For upper Columbia spring Chinook (Enetai River)--26 percent. That doesn't translate into a lot of new fish--5,000-10,000 by my accounting. That's why the accords also call for plenty of spending on new hatcheries. Remember one thing: once outside the bubble, the 100 million or so smolts released every year from the Basin (wild numbers are roughly 20 percent of that) must compete with 5 billion or so other smolts. Some years, there's room for everybody; some years not. It depends on a lot of things. For a real taste of the salmon world outside the bubble, check out this site for a few glimpses of the big picture, including information on returns to that Alaska hatchery. It's from a conference of salmon researchers from all sides of the Pacific Basin, held last April in Honolulu, which focused on "Migration and Survival Mechanisms of Juvenile Salmon and Steelhead in Ocean Ecosystems." Any freshwater tweak that boosts juvenile survival a few percent is lauded inside the bubble. Outside the bubble, it's decimal dust. Check it out.